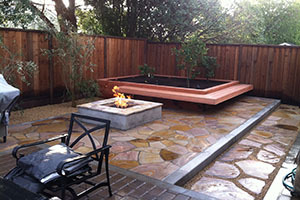 Blue Sky Designs is a landscape design, plus a build company serving the Bay Area of California for over 39 years. Landscapes artfully designed for longevity and sustainability. Beautifully installed, our goal is to avoid adverse environmental impacts or wildlife degradation, respect efficiency in water use, minimize labor, eliminate non-native invasive plant species and reduce waste while enhancing our natural surroundings. Blue Sky Designs, Inc. specializes in the design and installation of custom landscape environments primarily for residential clients. Experienced in all types of renovations, finding creative solutions to unusual problems is the design team's specialty. Blue Sky has been recognized by professional peers throughout California accumulating over 100 awards for special effects, small space design and installation, renovations and residential estate projects.Gardens designed and constructed by Blue Sky Designs, have been included for many years on Peninsula garden tours as well as being featured in a variety of magazines, periodicals and books.With construction and design working hand-in-hand we can assure that projects are well co-ordinated and that original design intent is maintained in the completed project. WHAT OUR CLIENTS HAVE BEFORE WE ARRIVE AND WHAT THEY HAVE AFTER WE LEAVE. Before: A blank canvas in Saratoga with an existing gazebo to incorporate. 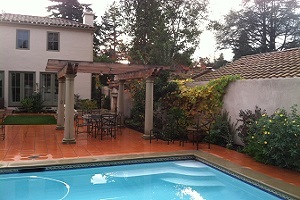 After: An outdoor kitchen, pool, spa, biological stream, multiple waterfalls and a tropical garden complete the picture. Before: An unusual driveway and front walkway during the current drought. After: California native grass and newly textured driveway and entry blend nicely. Before: An ocean view rear garden. After: Enhanced by a perimeter garden path, flowering perennials and outdoor amenities for cooking and warming up during cool coastal evenings. Before: A rotting and slippery railroad tie staircase. After: Transformed into a structural Bluestone stairway with free-formed copper grab rail. Before: A renovated house needed a stronger driveway and additional parking. After: New stone banded salt finished driveway, enhanced entry and off cul-de-sac parking. All Rights Reserved © 2005-2018 Blue Sky Designs, Inc.
Ken Coverdell is a licensed landscape architect, landscape contractor and general contractor. As a horticulturist, soil expert and water conservationist, he has grown Blue Sky Designs, Inc. from a two person team to a full service design/build group with over 15 employees. Imaginative and talented, the landscape designers and landscape crews are experienced at designing and building everything from hilltop pools and luxurious spas with detailed masonry to lush gardens that incorporate the clients dreams, imagination and desire to be surrounded by sustainable beauty. Designed for outdoor living in the San Francisco Peninsula Bay Area. 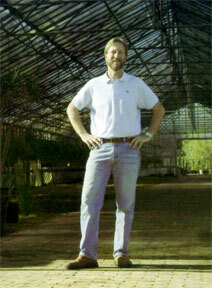 Blue Sky Designs has been licensed for landscape design and installation for over 39 years. "We're so happy with how our yard came out! Ken made certain recommendations during the planning process that really enhanced the final result. He had great vision for planning the space we have." "KC and team were wonderful!" "It's been one year since completion of my landscaping project, and every time I look out a window or spend time in the front and back yards, I feel enormous gratitude for the top notch, outstanding job." "Quality design and workmanship. Follow through was excellent." "It was really great to watch the crew work. Tremendous attention to details and quality. We are very pleased with the results."